Hey Gang, Baxter and I have been discussing phtography under the Model Photography part of the Forum. 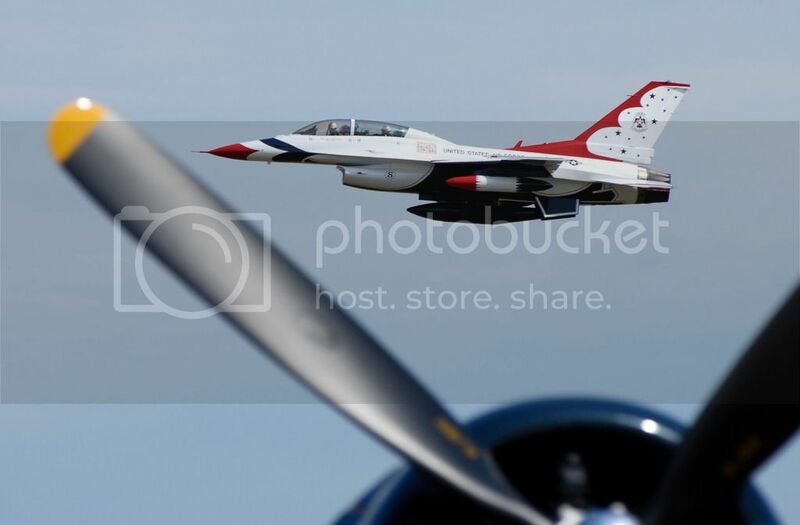 Me, being the pro (I hate that word) was asked to show some aviation photography from my files. Steve suggested that we move them to the Aircraft part where they might be relevant. Photographers always like to have victims to see their work. Let's try a few. 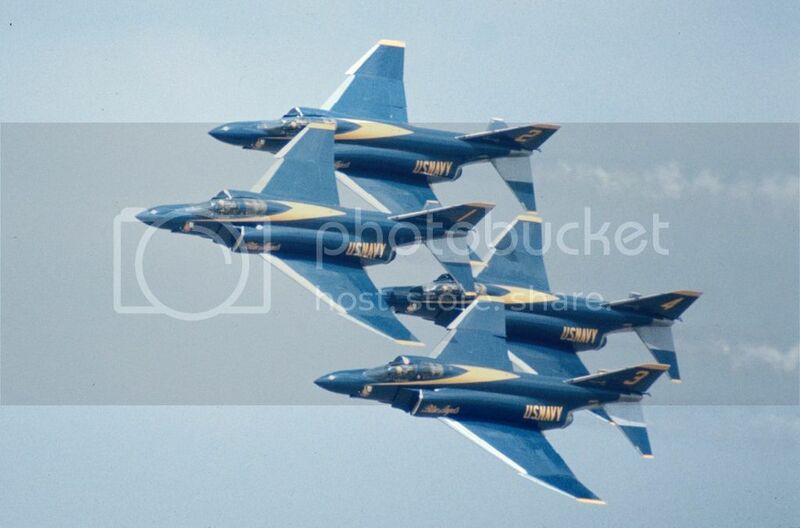 Here's an oldie when the Blue Angels flew F-4s and color film was mediocre. Max, that is a nice shot. You can really see how tight their formation is. Color film hey? I remember those days. The novice like me had to bracket shots and HOPE that I got a decent exposure. And then, HOPE that the lab develops the film ok. I guess that is why I like digital. You can instantly see what you imaged and make adjustments. But, I digress. Later, I will post some images as well. Keep em coming folks. 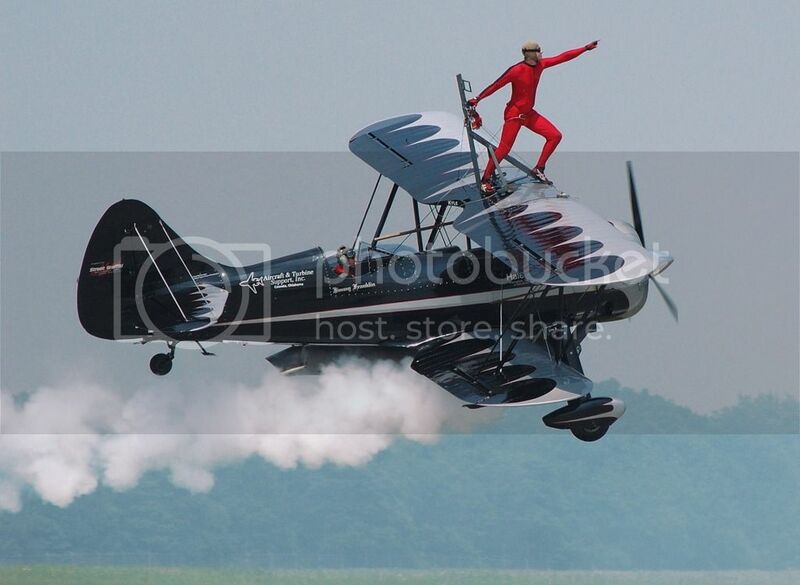 Max--since you love planes. Have you ever made it to EAA in Oshkosh WI? It is a candy land for the plane enthusiast. Here are a few that I took several years ago. Yes! I may have been in the same crowd! In 2009 we flew all the way from SE KS in a Cessna 185 bush plane with all kinds of photo gear and camped under the wing for several days. Scary approach I might add! It was like a carrier approach with HEAVY traffic YIKES! 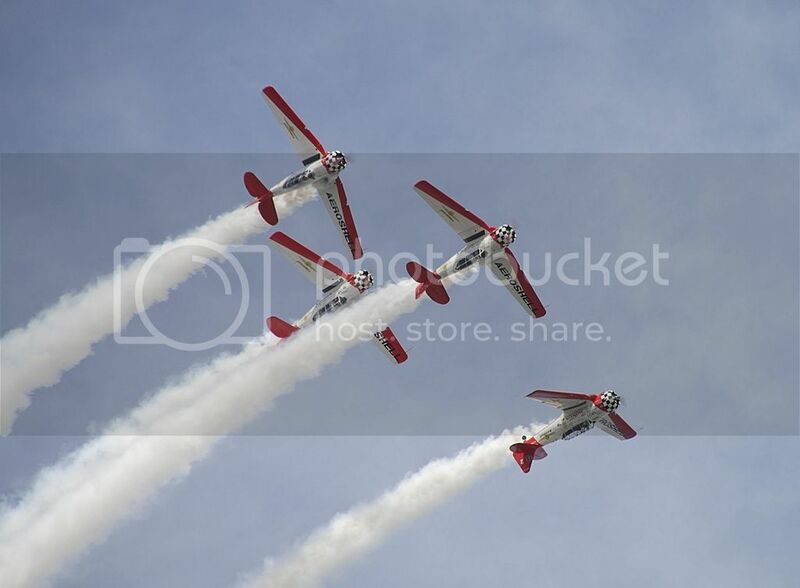 I'll find and post my shot of the Aeroshell AT-6s next. Quite a lifetime adventure for sure. Very nice! Good in-flight shots! My wife just got back from taking our Grandson to Oshkosh. She took over a thousand pictures, but still hasn't finished loading them into her computer, so I have not seen any of them yet. 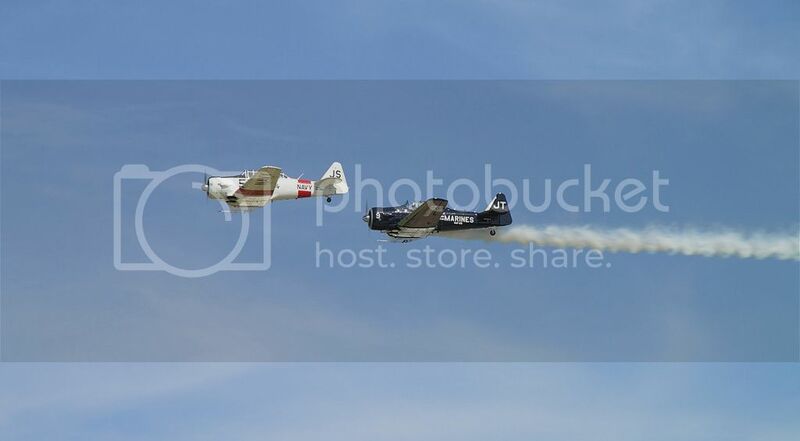 I have some from last years air show in Traverse City. I'll post a few when I get home. Yes it's easy to take that many images there. Please be sure to post some of them. I would love to see them. 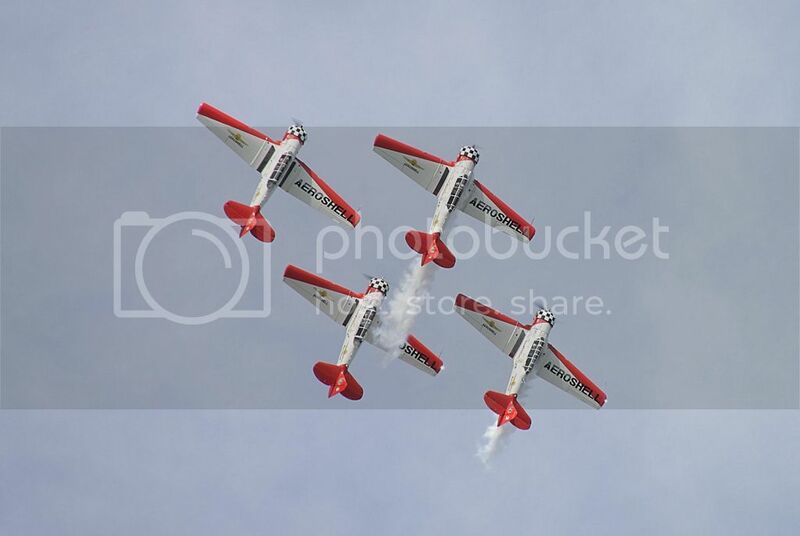 Here are some pictures from the 2014 Traverse City Air Show, hope you enjoy! Hey Bruce, those are some realy nice shots! Thank you Bakster; and I apologize, I forgot to mention your pictures look amazing! How did you like the Oshkosh Airshow? I've been meaning the last two years to go to the Dayton Airshow. Bruce--no worries and thanks for the kudos. Again, not a great photo, but a cool pic! 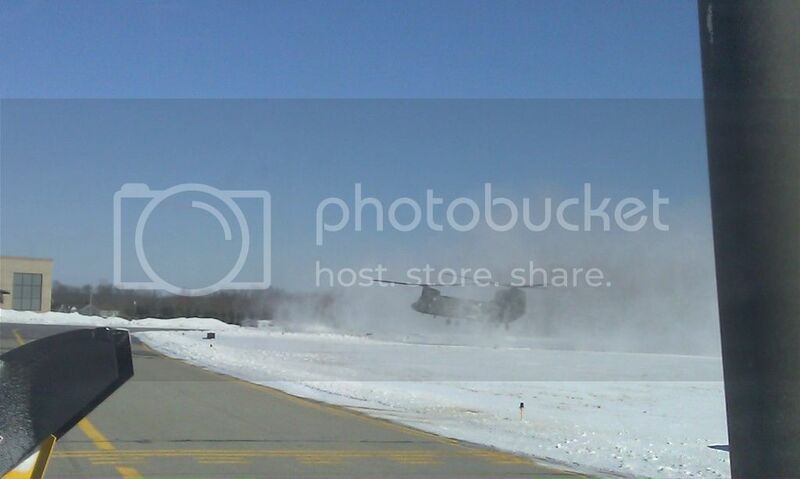 I was in the tractor, sweeping snow (ya can see the end of the snowblower chute, to the left). This chopper is ex-Guard, purchased by "Construction Helicopters" last year. It has since had a $150,000 paint job...haven't seen it since though. Here are a few shots from Osh Kosh last year. All shot with a Nikon D5300 with a 55-200 Nikkor lens. Excellent images guys. Its really cool to see what you have taken. Keep em coming everyone. My John, those are really nice, and this comes from a person who does this for a living for over 50 years. Good job! Blue Angels, Wow! Here's one from 2005. The title of this one is "Next to the Last Show". 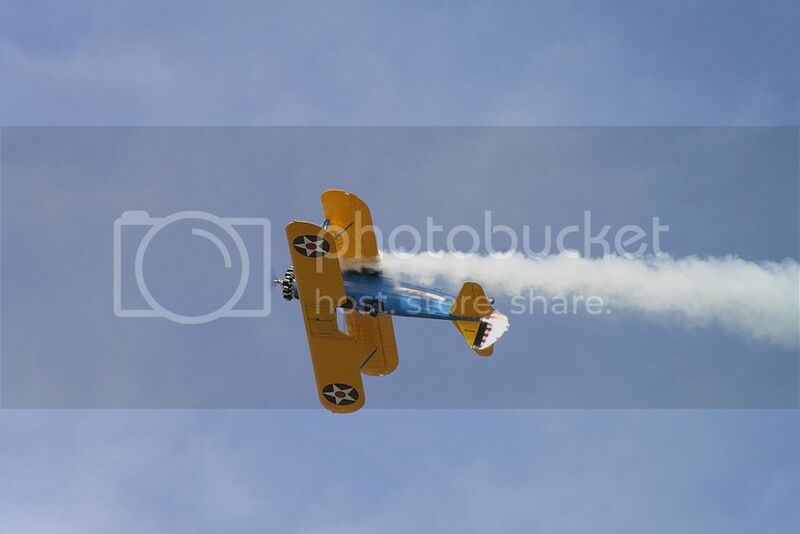 The very next show Jimmy Franklin was killed and the jet engined Waco destroyed in a mid air with a performing friend. I use this shot in lectures about the power of photography and that these shots are indeed moments in time. Great shots! I love those Blues with the F-4s. Really cool stuff. I'm no pro, and I hope it's ok to share this one here (don't want to hijack your thread) but I thought this was the coolest heritage flight I've ever seen. 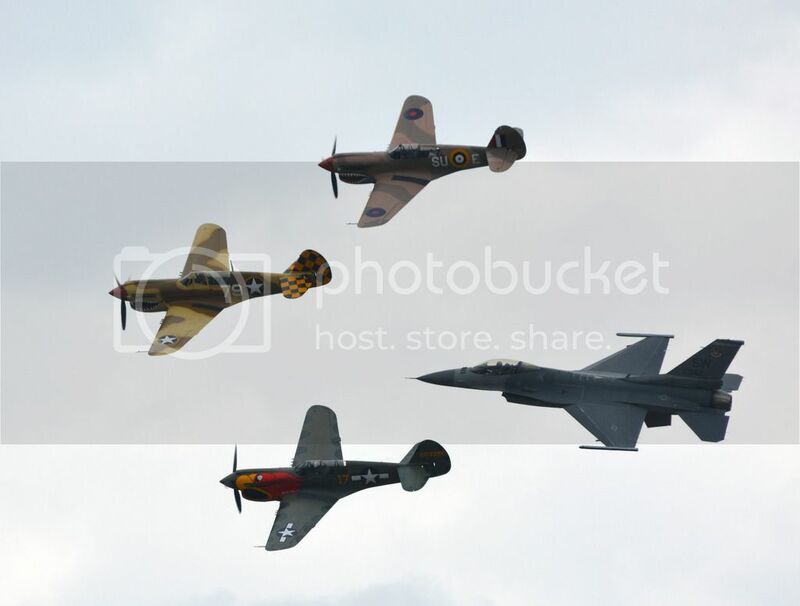 They had five P-40s in the air at this year's Planes of Fame Airshow in April of this year. Hey Brandon, you are not hijacking this thread and the shot is great! 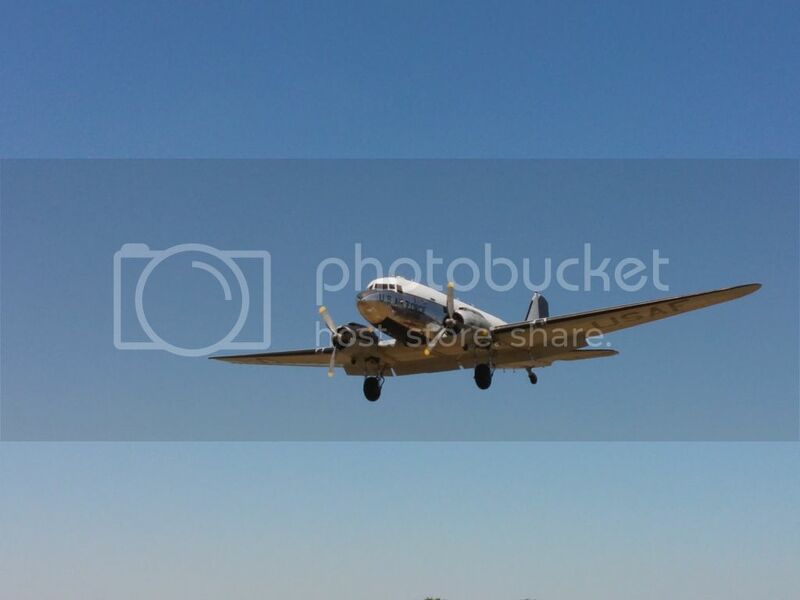 This is what we like to see, Aircraft Photography by everyone! PS--Being a photographer by trade I do cheat by sometimes getting special access and having any lens and equipment availiable. Don't be intimidated, it's just my job! My lens of choice for wildlife and airshows is an expensive (and Heavy) Nikon 200-400 f4. It's big and klunky but incredibly sharp. Quite the load for hand held but well worth it if you're serious. Its relatively large aperature for a large telephoto gives plenty of speed and really quick autofocus. The 6K price is a hard one to swallow but I did make a living with it. With this lens the prefered body is the Nikon D7100/7200 24MP body with the DX size sensor which magnifies the lens by 1.5X over a full frame Nikon making it equivalent to a 300-600mm. See why I'm hard to compete with? I cheat. 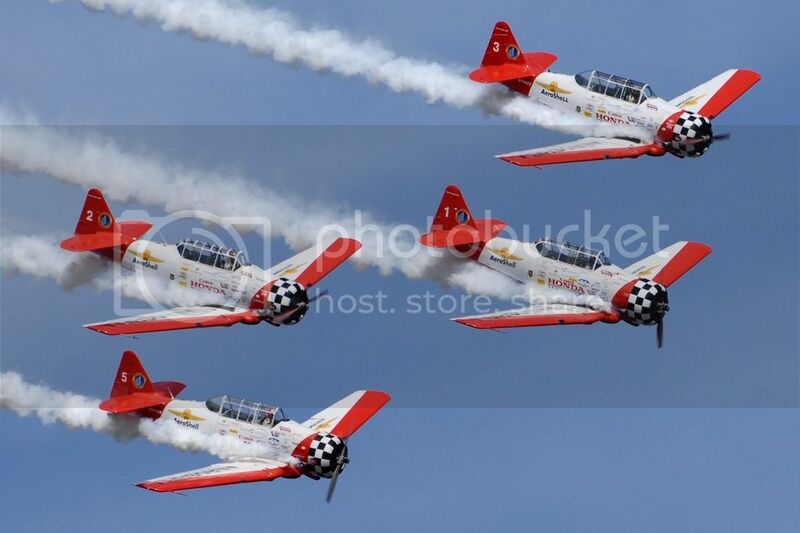 Here's the shot I promised on the AeroShell team at Oshkosh 2009. Fat Albert and little friend. They had five P-40s in the air at this year's Planes of Fame Airshow in April of this year. Years ago before such air shows were basically banned around here there was a very similar air show that included WWII fighters, trainers and an F-14 Tomcat. It was amazing to see how huge the F-14 was compared to the WWII warbirds!!! See why I'm hard to compete with? Can't compete with an ego like that! Hey Big Jim, nice shots for sure! Sorry I'm not egotistical and I hope I don't come across that way, I'm just fortunate to have had one of the best jobs on the planet. My job has been a fairy tale of adventure for sure. I am experienced and share my experiences with others as We do on the modeling forum. The guys here are experts and I'm not, I'm the one learning. Sharing how-to photography is also part of my life and that is why I explained how the shot was done. Last week I spent a day judging the county fair 4H photography. I provide free programs to civic groups on photography, I speak at college career days at colleges, I've published technical articles on Photography and taught Advanced Photography at College level. I Judge Photography for local events. I try to share my knowledge that I've been fortunate to receive. I don't consider myself an expert but I am experienced enough to help other people with advice if they need it just as the Gang does on the Modeling Forum. Ego is not my purpose here. Sorry you took it that way. I was only telling how I "cheat''. Hey Don, focus is always an issue at an air show or any event where things are changing distance. Newer Canons and Nikons at least the Pro ones now have computer assist systems that not only follow but predict where the subject is going. That linked to newer fast focusing lenses has really helped the problem. Setting the focus to near infinity and stopping the lens down helps pick up some depth of field. As always you lose shutter speed but with the latest cameras the ISO can be turned up to unbelievable numbers and still get results. The bottom line is that photography is a series of comprimises that must be delt with and new technology certainly helps. We do the best we can! Say Don--that is the same type of problem that I had at the airshow. In fact, the lens was working so hard that at one point it began to hunt uncontrollably. I couldn't get it to focus. I thought that maybe I had broken it. It was a Tamron lens as well. The lens eventually stopped freaking out and it began to work ok. Maybe it overheated. Not sure. The constant change in focus sure gave the lens a workout. Here's one that's different. I was trying to get some foreground framing as this F-16 came ripping through on a low level pass. I lined everything up and gave a burst as he passed. Several so-so shots but one good one. My wife calls it luck but you do have to be there with your finger on the trigger! This dates back to 2008, at the Akron Ohio airshow. I may get so drunk, I have to crawl home. But dammit, I'll crawl like a Marine. Hey Wayne, I checked it out. Many cool aircraft there. I liked the Cat. 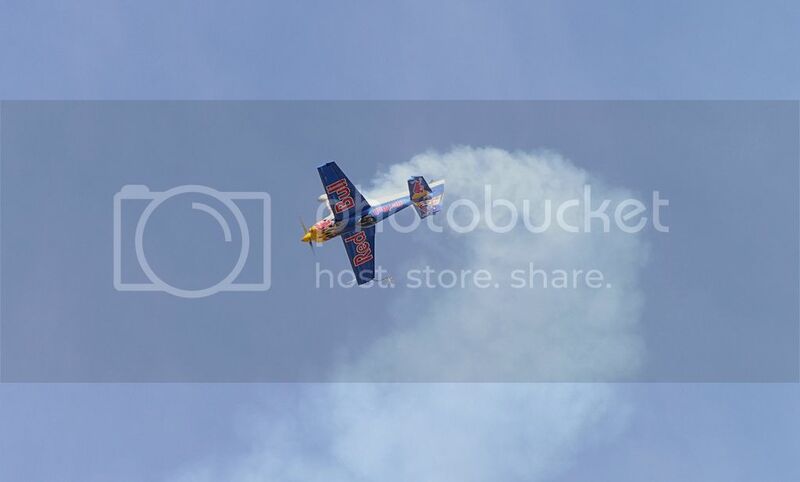 What could be more fun than an Air Show?